Dual Player is a free Windows 8 Media Player that lets you play two media files simultaneously on your system. This app basically is meant to entertain you. You can select any two songs or videos from your local library, play them side by side in the app, and have fun. The app presents a dual screen interface to play two audio or video files together. It supports almost all popular audio and video file formats. All the necessary functional keys are in built in this media player and work independently for both the screens. The app also enables full screen mode to play any audio/ video file. However, you will hear sound for both the media files in the playback. You can either browse and select audio/ video files from your system or create your own playlists in the app. You can play any two songs of your choice and mix them to give it a DJ effect also. 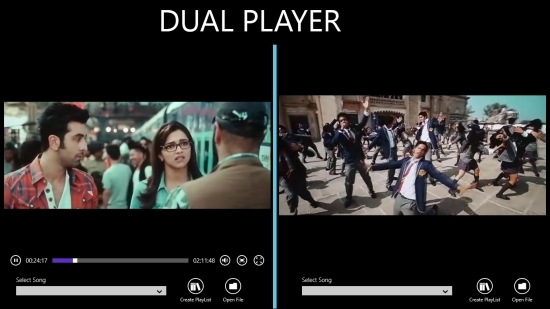 Dual Player is freely available in Music & Video category of Windows Store. In order to view the app directly in Windows Store, you can click on the link given below at the end. Let’s see how this funky media player works. This free Windows 8 Media Player is very simple to operate. Since, there are independent functional keys provided for both the screens, it feels as if you are playing two different audio/ video files simultaneously in two different media players. As you launch the app, you will see the main interface displaying two media playing screens. Browse songs/ videos independently to be played on the two screens. You can also switch to Full screen mode to view a video on full screen. The option to Create Playlist lets you select multiple media files and add to your playlist. This will let you play your favourite audio/video files straight from this app’s playlist and you won’t have to get into your system’s library again and again. Check out some other free Windows 8 media players reviewed by us: PL@Y, V2PLAY, Windows Player Pro. 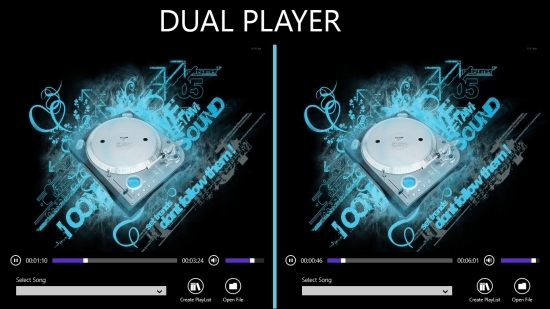 Dual Player is a funky music player, one of its kind. It lets you play two media files side by side and have fun. You can create your own DJ mix and rock. Feeling excited? What are you waiting for then. Go ahead and try this app. Share your feedback via comments.